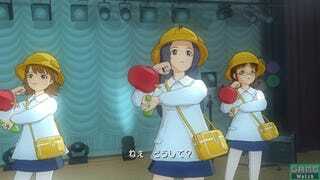 If it wasn't enough that the ages of virtual idols for Namco Bandai popstar title THE iDOLM@STER: Live 4 U already were in the low teens, the new DLC for the Xbox 360 offers a pre-school type "Child Smock" and matching "Child Hat", sandbox pale and shovel, and a band-aid to boot. Available in separate packs, all the kiddy contents totals 1800 Microsoft Points. That's right, DLC to make the teenage singers look younger.